The northern hemisphere's permafrost regions have been concealing a really unpleasant surprise: mercury. A lot of mercury. Nearly twice as much mercury as the rest of the planet's natural mercury combined. Researchers from the US Geological Survey studied core samples from the Alaskan permafrost, and their estimates show 793 million kilograms of mercury have been trapped in the northern hemisphere's permafrost since the last Ice Age. This finding has grave implications if the permafrost melts away. And the melt has already started happening - in the Arctic, melting permafrost has revealed some giant (thankfully dormant) viruses tens of thousands of years old that could awaken and wreak havoc. Deforestation has caused permafrost melt in Siberia, which in turn caused the ground to collapse into a giant crater; and in other parts of Siberia, permafrost thaw has been linked to the appearance of mysterious sinkholes and craters. Now there's also mercury to worry about. If the permafrost continues to melt, it could release a tremendous amount of mercury, and this could, in turn, impact ecosystems all around the world. "There would be no environmental problem if everything remained frozen, but we know the Earth is getting warmer," said lead author Paul Schuster, a hydrologist at the US Geological Survey. 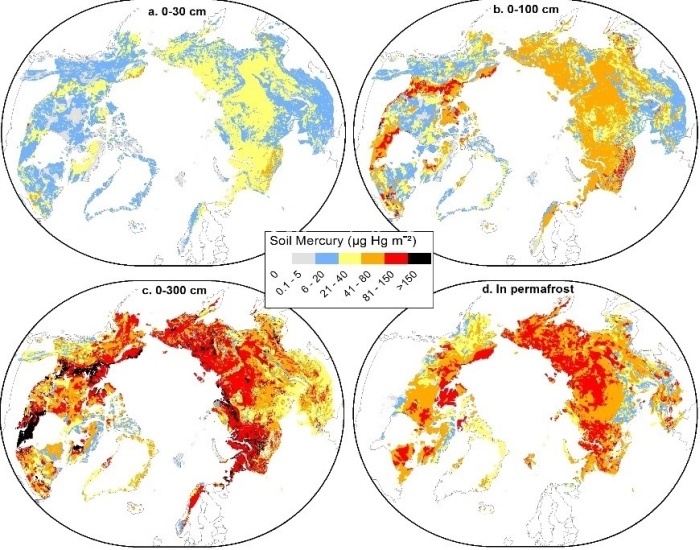 "Although measurement of the rate of permafrost thaw was not part of this study, the thawing permafrost provides a potential for mercury to be released - that's just physics." Natural mercury enters the permafrost from the atmosphere. As part of the mercury cycle, atmospheric mercury vapour binds with organic material in the soil, which is then buried by sediment. Over time, it is frozen into the permafrost. To gauge the mercury levels in the permafrost, Schuster and his team drilled 13 core samples between 2004 and 2012 from different sites around Alaska, selected for their diverse soil characteristics to represent the entire northern hemisphere. The measurements taken by the team were consistent with published results for other tundra soils, and with 11,000 measurements taken from 4,926 other non-permafrost sites around the world. According to the team's calculations, there are 793 gigagrams (793 million kilograms), or more than 15 million gallons, of mercury frozen in the northern hemisphere's permafrost. That is, the researchers said, roughly 10 times the amount of all human-caused mercury emissions over the last 30 years. If we include non-permafrost soils in the permafrost regions, there are 1,656 gigagrams of mercury stowed away down there. This is nearly twice as much as is found in non-permafrost regions, the oceans, and the atmosphere combined. If it were to leach into the waterways, it could have grave implications. Inorganic mercury can be transformed by microbes into methylmercury, a potent neurotoxin. Cases of methylmercury poisoning have occurred in humans after eating fish from methylmercury-contaminated water, and it can cause central nervous system damage and birth defects. "There's a significant social and human health aspect to this study," said Steve Sebestyen, a research hydrologist at the USDA Forest Service in Grand Rapids, Minnesota. Sebestyen was not involved with the study. "The consequences of this mercury being released into the environment are potentially huge because mercury has health effects on organisms and can travel up the food chain, adversely affecting native and other communities." And if the mercury gets into the atmosphere, it could travel around the world. The next step in Schuster's research is to model how climate change could cause the permafrost to release mercury, and how it would spread around the world. "24 percent of all the soil above the equator is permafrost, and it has this huge pool of locked-up mercury," he said. "What happens if the permafrost thaws? How far will the mercury travel up the food chain? These are big-picture questions that we need to answer."